Big Time Gaming is a world class entertainment company with a diverse range of unique products and a team of experienced developers from various corners of the industry. With over Thirty years combined experience in online gaming, they pride themselves on innovation and creating games to an international standard. 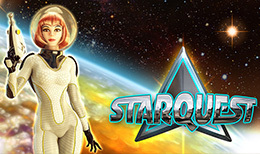 Star Quest is a Six-reel slots game with up to 6 rows and an amazing 117,649 ways to win. Set in the far reaches of space, one woman is on a quest to find new planets and discover the life they may or may not hold. The background of the game contains a planet with the aurora borealis visible at its edge, and a giant web of stars fill the rest. The view of this beautiful sight is not obstructed by the reels, as they are transparent. Before you start the game, you must set your bet. You do this by using the > and < buttons underneath the “Stake” to increase and decrease your bet. You can choose to bet of £0.20 to £20, and all pay-outs are multiplied by the stake of each individual spin. The Auto Spoon feature in Star Quest is very customizable. With the ability to choose the number of spins, loss limit, and single win limit, along with the ability to stop the auto spin whenever they wish, the player is in complete control at all times. Using various sized symbols that can cover whole rows, the total number of rows available changes depending on what symbols you get. The total number of pay lines available also changes, as additional wins can be formed from right to left, as well as the normal left to right. The symbols the game uses are the usual 9, 10, J, Q, K and A, along with Red, Blue and Green gems and the ‘SQ’ logo, which is the most valuable symbol in the game. A player can win by matching consecutive symbols, regardless of height, from left to right starting from the left most reel, or from right to left starting from the rightmost reel. The wild symbol in Star Quest is a Full Reel Wild and consists of an image of the heroine of the game, complete with her space suit and gun. The symbol takes up a whole row of the slots, and appears on reels two, three, four and five. The Wild Symbol substitutes for all others to form winning combinations. Every time a Full Reel Wild on a reel and fills all possible positions, it will freeze in place and activate the Respin Wilds Feature. When this is activated, the player will be awarded a free spin and the multiplier will be increased by a value of 1. If another Stacked Wild lands on the respin, the process will continue, awarding another free spin and increasing the multiplier value once more, to a limit of x5. When a winning combo includes more than one Wild, the winnings will be multiplied by the total multiplier value. Star Quest is fairly simple by design but the variety in gameplay is high. With the combination of the wild multiplier and the huge amount you can wager, this game is not for the light of heart. The game has an RTP of 96.22%, meaning players can expect hours of fun with little risk of loss.